The new movie, LEGO® FRIENDS: GIRLZ 4 LIFE, is all about friendship, trusting yourself and standing up for what’s right no matter what the cost. All set to an awesome rock soundtrack you’re going to love! Join Olivia, Stephanie, Emma, Mia and Andrea as they learn that fame isn’t important, it’s your friends that count! 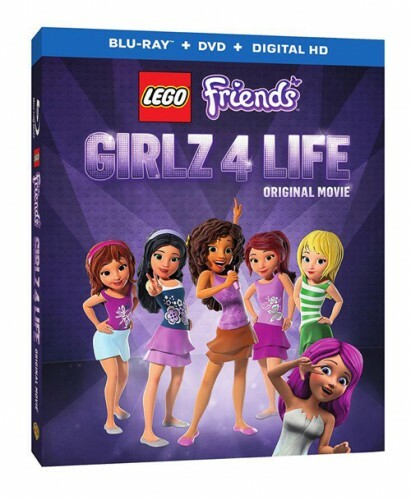 Own LEGO® FRIENDS: GIRLZ 4 LIFE on digital HD, Blu-ray Combo Pack and DVD now. My 7 year old daughter was super excited to receive this Blu-ray combo pack! She loves Lego Friends. She has so many of the books and lego sets. She doesn’t own any of the DVD’s, so she couldn’t wait to watch this. She loves seeing the special friendships of the characters, her favorite being Olivia! She has the digital copy on her iPad, the dvd in my car dvd player and the blu-ray is in her dvd player in her room. She just loves it! This movie is great for girls of all ages and really does teach them great things about friendships. Be sure to visit the official L2M website to stay updated with all things L2M! ***I was given a product in exchange for my honest opinion. This review is based on my experience with the product. I am not affiliated with the company and everything in this review is my opinion. Disney•Pixar The Good Dinosaur Available On Blu-ray™ Combo Pack, Digital HD and Disney Movies Anywhere February 23rd.